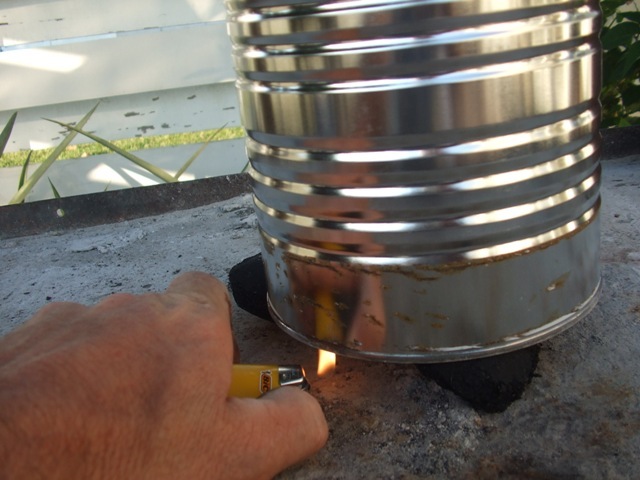 Need to make your charcoal chimney? Click here to find out how! To safely light your charcoal starter, you need to gather the proper tools. Ideally you should be lighting this in your grill or on a Dutch Oven table or charcoal table, or in a fire ring, wherever you will be using your hot coals. Do not light this on top of anything that can catch fire! 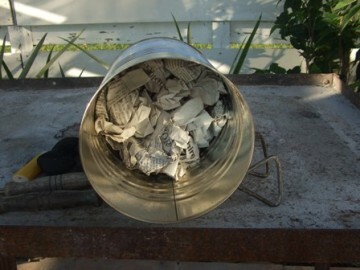 First, take the newspaper, ball up three sheets individually, and push them down to the bottom of the can or chimney. If I have forgotten to bring newspaper, many times I will get those free sale flyers in the front of Wal-mart or a convenience store to use. Another alternative is to peel apart the layers of the bag the charcoal comes in, ball this up, and use this. Put about 24 briquettes into the can on top of the newspaper. If you need more, you can light several cans at once, or buy a larger-capacity charcoal chimney. A commercial-made chimney usually has holes build in along the bottom which will provide enough ventilation for burning. Now place the can right on top of them so the can is lifted up off the table, and there is a space underneath for ventilation. During the next steps, leave the can on top of these briquettes. From the bottom side of the can, in the space between the briquettes you have used to ventilate the can, light the newspaper. This will start the charcoal. Leave the briquettes in the charcoal chimney until the majority of the coals are ashed over. Generally, the charcoal will be ready to use in about 20 minutes. Occasionally, if the humidity is high, the charcoal may not light the first time and you may have to repeat the process. 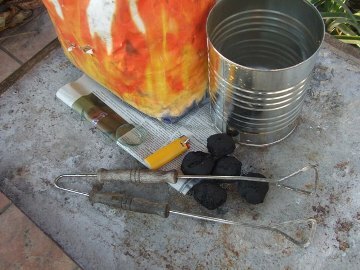 Re-use the same charcoal, just put fresh newspaper in the bottom of the can. When the charcoal is ready, again, when the majority of the coals are ashed over, use the tongs to lift up the hot can and place to the side. For grilling, spread your charcoal as you normally would. If you will be using the briquettes for dutch oven cooking, use the tongs to place the hot coals on top of and underneath your dutch oven. This quantity of coals will be adequate for about 30 minutes of cooking time. If you are cooking something that will take longer, start your next batch of coals as soon as you have placed your first batch on and under the dutch oven. At Home In The Grill Too! This method works just as well in your home charcoal grill…again, using no lighter fluid. Just light the charcoal chimney right inside your grill, use the tongs to pick it up and move it out of the way when the coals are ready, and use the tongs to spread the charcoal for the grill. This is the only method we ever use to start our charcoal, whether we are at home, family camping, or camping with the Scouts. Planning to cook for a large group? Just use multiple cans at one time and start them one after the other. We did this at Boy Scout summer camp one year when we volunteered to cook for over 2000 people for dinner. (Yes…I know!!!!) We asked the kitchen to reserve ten #10-size cans for us…filled them up using the peeled layers of the bags instead of newspaper…lined them up in the two long grills, and then just lit up our homemade charcoal chimneys one right after the other with no problem for easy grilling! !